So coder come up with an interesting idea, and after some careful thinking I found a way that could be integrated into the game level up system. As you know (or maybe not, I don't remember anymore if I already posted about this), there are 12 skills, 4 x 3 areas of interests. it was done quickly but I think gives a good idea. Of course in the game each option will be a named skill, like the HP+10 will be "Toughness I" and so on. This way balancing is MUCH easier for me, since the options are mutually exclusive. Also avoids the possibility of creating invincible characters by maximizing all skills through grinding, but still gives a very big variety of opportunities and replay value. Personally I'm enthusiast about this system combined with the other classic "assign skills point on level up" and I don't see any downsides to it but comments/suggestions are welcome of course! Forgot to add: the coder's idea was that you could increase your basic skills only with the new tree system. So for example one choice could be "Dexterity +1" and another "Medicine +1" and so on. I am not sure about this one, since I think some RPG players prefer to assign more skillpoints on each levelup. However if we have a level up every level gained, that could work too, since in this sequel +1 in a skill will be more like +10/20 in the old game, because the skills scale is much smaller, not 0 to 250 but more like 0 to 25 (have yet to decide, but I don't think will be higher than that). The Guardian is the only who drags along all the heavy weaponry. I am interested what roleplaying reason you have to assign the 4 strength to the soldier and instead ut the guardian at max endurance? If I understand the idea correctly, then the choices I have a level 1 are different from the choices at level 2 (and lost forever if I take a different path), right? What are the reasons for providing skill increases both by "pick one of three" and by "assign skill point"? If each character's (or class') specialization tree is different, and offers viable alternatives and not just ways to gimp yourself harder, it might be interesting. If they're all the same for every character, you would only ever stray outside what's most effective for your class for the experiment's sake, and it would mostly be a waste. For what it's worth, I think that having separate advancements is coolest, but make the "pick one of three" be abilities that are not necessarily directly related to basic skills - fx unlocking special moves (choose between powerful single target/medium multi target/weak but status inducing multi target), weapon/armor unlocks and specializations, or whatever your devious minds can come up with. Skill specializations are also possible, such as choose between a massive bonus to hacking, lockpicking or repairing. Lonestar51 wrote: The Guardian is the only who drags along all the heavy weaponry. I am interested what roleplaying reason you have to assign the 4 strength to the soldier and instead ut the guardian at max endurance? Well first of all Heavy Weapon doesn't mean in the literary term, but to the damage they do. A bazooka could be made with very light material, but you need certain skills to handle it Also because if you notice all the row sum is equal (I found out is a great way to balance the game, sum all the row/columns and they must result in the same value). Lonestar51 wrote: If I understand the idea correctly, then the choices I have a level 1 are different from the choices at level 2 (and lost forever if I take a different path), right? Partly right, there can still be on level 4 an Accuracy +1 or in level 10 and so on. The point is that differently from the usual system, you can't have a bit of everything but you must choose. It depends a lot on what will be the level cap and the frequency (every X level will show). Lonestar51 wrote: Regarding your comment on grinding: Will there be any grinding possibilities? Yes don't worry, we talked about this a lot. Grinding will be present but should be optional, and impact other things beside XP and skills. In general main/side quests will bring a lot of XP, grinding will still give XP but not too many. Instead will let you gather resources/materials for crafting and other stuff. But not XP, I don't want to make a game where the leveling is based on grinding... the infamous kill 1000 rats to get to level 2! Lonestar51 wrote: What are the reasons for providing skill increases both by "pick one of three" and by "assign skill point"? Franka wrote: If each character's (or class') specialization tree is different, and offers viable alternatives and not just ways to gimp yourself harder, it might be interesting. If they're all the same for every character, you would only ever stray outside what's most effective for your class for the experiment's sake, and it would mostly be a waste. No each class is different, and at "key" level like 5-10-15-20 etc I could offer a unique choice based on the character, or have some separate individual "perks". Franka wrote: For what it's worth, I think that having separate advancements is coolest, but make the "pick one of three" be abilities that are not necessarily directly related to basic skills - fx unlocking special moves (choose between powerful single target/medium multi target/weak but status inducing multi target), weapon/armor unlocks and specializations, or whatever your devious minds can come up with. Skill specializations are also possible, such as choose between a massive bonus to hacking, lockpicking or repairing. That was my idea, I have to think if is possible depending on how many "special abilities" I can come up with. 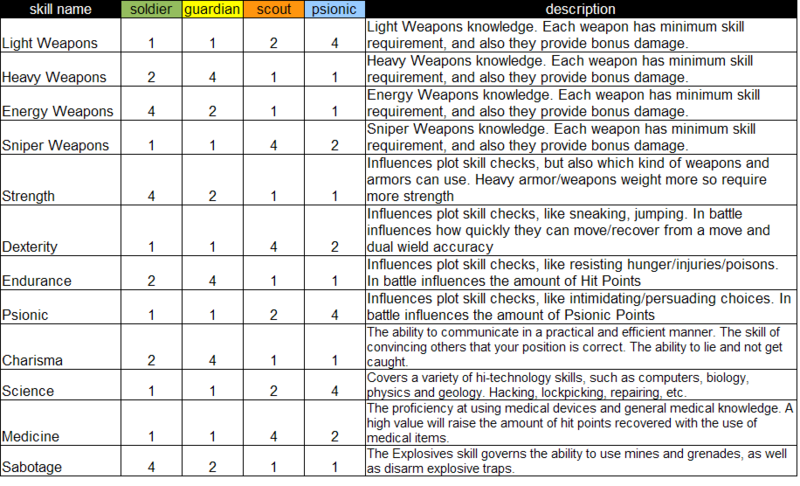 Even considering a choice every 2 levels, and a level cap of 30, that would be already 15 x 3 = 45 abilities to think for just 1 class even if of course some of them might be shared amongst different classes, like "Toughness" could be both for the Soldier and Guardian. Could be even for the other ones, maybe at higher levels. Regarding the heavy weapons: They are called such as they are literally heavy. (And while a bazooka may be light, the ammo sure is not...) If I may add another argument, from a game design perspective: The guardian is supposed to e the heavy hitter. If he is also the one who has most HP, all other classes become second-rate. Of course you might add high agro to heavy weapons, but this fails for two reasons: in PS you can deliberately agro with any hero by using high fire rate. Also there may be more guardians in the party, and a guardian-heavy party would have massive advantages vs any other. Okay, Jack has run wild with my idea and made everything much more complicated. 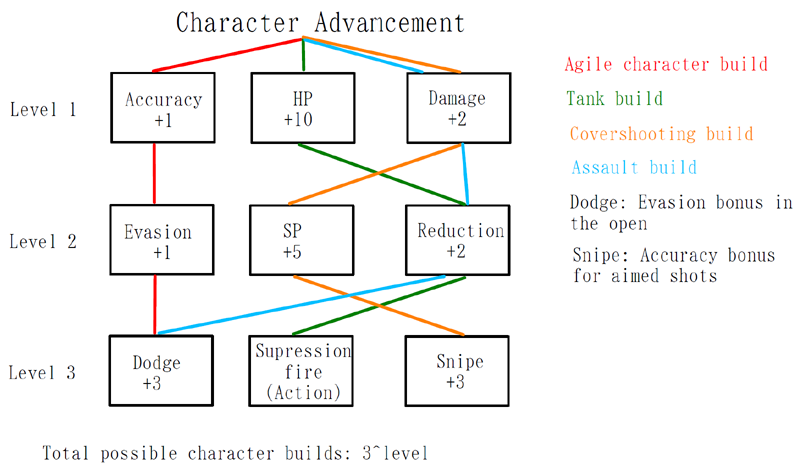 The basic idea was that instead of skills every character has a class specific tree he goes trough as he levels up. At every level the player has three choices to advance the character further, the choices are specific to that level and can't be revisited. The choices can be between new actions, attribute boni or new equipment permits. Of course attribute boni would be the most numerous, trough a lot of them would not be general boni but situation specific instead. For example an evasion bonus under cover or a reduction bonus against explosives. Or even more exotic, scouts may get the chance to get a hefty damage bonus against mineral aliens. It would be pretty easy to show the complete tree in the GUI for future planning as well as writing an automatic level up script for our more casual players. While you would only have three choices at every character level up the number of possible builds would still be gigantic at 3^level possible builds, though some of them would probably be only different in order of acquisition. The out of combat skills could be either integrated into the tree or a separate system where you simply assign skill points. If it's integrated into the tree you would get levels where the only available choices would be out of combat skills. It's of course also possible to make more specialized skill boni. For example a bonus to disarming devices. It's important to keep in mind that we are handling a pretty huge number of characters. With the new characters we are at a dozen already, aren't we? In a game were you only have one character or 3-4 permanent team members you would need much more complicated character advancement methods to keep that interesting. But what's fun for a handful of characters can quickly become a chore for a bigger cast. In these cases the party composition becomes the most important and most fun part instead. At least that's what I always felt playing RPGs.